Prior authorizations are one of the biggest frustrations for doctors and their staff. In order to get certain medications approved by patients’ insurance companies, the standard method of paper prior authorizations involves filling out long forms, spending time on the phone, and faxing back and forth potentially multiple times over several days. However, there is now a new alternative. Introducing: Electronic Prior Authorization or e-PA.
Electronic Prior Authorization also known as, e-PA, is a streamlined method of completing prior authorizations electronically. A message with the patient’s information and prescription information is securely sent online to the Pharmacy Benefit Managers (PBMs) for review. A lot of the time e-PAs are completed directly in the Electronic Health Record system making it that much easier for the provider and staff to complete in their workflow. There are several different kinds of electronic prior authorization on the market today. Many early versions turn the paper forms into PDF documents and give providers a way to fill out those forms online or electronically. Many times they are the same forms as the paper versions but allow online entry and submitting to the insurance company which saves time over manually filling and faxing. Newer e-PA implementations (like MDToolbox offers) take it to the next level by pre-filling all of the patient and medication pertinent information. They also have simple question sets that are filled out and submitted to get the prior approval instead of needing to complete the long forms. In a 2010 AMA survey it was found that physicians alone, not including other staff, spend on average 20 hours a week dealing with prior authorizations1. The time saved by using e-PA means that physicians can devote more time to caring for their patients. The same survey showed 69% of physicians typically wait several days to receive prior authorization from an insurer for drugs, while 10% wait more than one week. By using e-PA, physicians can sometimes get a response immediately, therefore patients would not be stuck waiting several days or making failed attempts to pick up their prescription at the pharmacy. 20-30% of patients waiting on PAs ultimately give up without getting their prescription2 while up to 70% of patients don’t receive the original prescription prescribed by their provider if a prior authorization is required3. Not only will physicians have more time to devote to patient care by reducing the time spent on prior authorizations with e-PA, patients will also be more likely to follow through with their originally prescribed treatment. A study presented in Health Affairs put the monetary cost of physicians interacting with insurance plans at $83,000 annually4. By utilizing e-PA and reducing administrative efforts put into manual prior authorizations, these costs can be drastically reduced as well. It is clear to see that there are many obvious reasons providers should be happy to switch to completing prior authorizations electronically and it’s expected that this technology will be a welcome change in offices across the nation. Electronic Prescribing of Controlled Substances (EPCS) is now legal in all 50 States. Missouri and Vermont were the last two states to authorize electronic prescribing of controlled substances. Missouri’s regulations became effective July 30th, 2015. Today, August 28th, Vermont became the final state to allow prescribers to legally prescribe controlled substances electronically for schedule II-V drugs. Prescribers can now electronically prescribe controlled substances at any participating pharmacy in the United States. National EPCS availability is a key step in combating prescription drug fraud and abuse. With the adoption of EPCS, patients will no longer be able to forge paper prescriptions. Drug seeking behaviors and patterns will also be easier to identify and respond to. With the increased electronic connectivity of pharmacies, medication histories will be more readily available. All of these factors will also create a much safer environment for patients. The state of New York has passed legislation requiring prescribers to do all of their prescribing electronically starting in March next year. As that deadline draws near and potentially other states follow, it will be necessary to stay current and have a viable EPCS solution. Currently, the national average of pharmacies enabled for EPCS is 80.3%. Now that EPCS is legal in all states and as more states make EPCS a requirement, we expect to see more and more pharmacies coming online and allowing receipt of EPCS. MDToolbox offers both a certified stand-alone e-Prescribing solution, as well as an integratable solution for EHR or PM systems to add full e-Prescribing capabilities or add on just EPCS capabilities. MDToolbox is ready to help prescribers and software companies through the DEA requirements to get fully prescribing controlled and non-controlled substances electronically. Check out our EPCS page or contact us at info@mdtoolbox.com for more info. A much larger percent of pharmacies are setup to utilize EPCS. 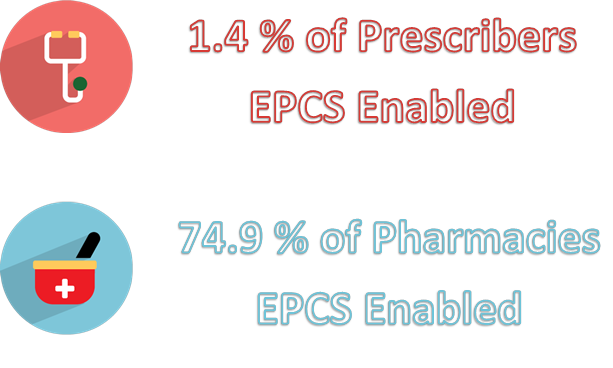 The national average of pharmacies enabled for EPCS is 74.9%. A state by state comparison of the percent of pharmacies with EPCS capability, can be found on our EPCS page. 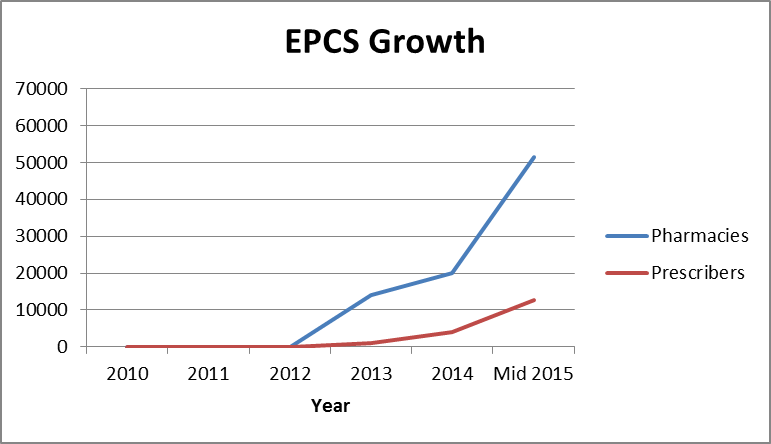 Even though EPCS is now legal in 49 states and D.C., its growth has been rather slow compared to the rates of non-controlled e-Prescribing. Surescripts’ report also found that 67%, or 1.2 billion, of all new prescriptions in 2014 were e-Prescribed. However, while there was a 400% increase in controlled substance e-Prescribing from 2013 to 2014, the number of controlled substance prescriptions was only 1.67 million. Out of almost 70,000 total pharmacies and more than half a million e-Prescribing prescribers, the amount of pharmacies utilizing EPCS far surpasses the amount of prescribers. While the statistics are surprising considering EPCS has been legal since 2010, there are several factors involved in the low percentage of prescribers. These include issues such as their software not being ready to meet the DEA requirements, as well as the number of steps that prescribers must go through to be setup for EPCS. Though the steps involved may seem complex, e-Prescribing vendors are doing their best to make the process as smooth as possible for prescribers to utilize this important technology. MDToolbox has created a simple 4-step process that walks prescribers through completing the DEA requirements for EPCS that can be completed within minutes. * We also provide this EPCS solution as an integration option so that EHRs and other technology vendors can add the streamlined process to their existing workflow. There are several benefits of EPCS including increasing patient safety and security, as well as reducing fraud and abuse. The easier it is for prescribers to setup and use EPCS, the more likely they will be to take advantage of the benefits and increase their usage. New York State has officially delayed the requirement to send all prescriptions electronically one year until March 27, 2016. The delay came just two weeks before the original I-STOP mandate was set to go into effect. Under I-STOP, providers will be required to send both non-controlled and controlled substances electronically. Paper prescriptions will no longer be allowed. The main reason for the delay was stated as a lack of software vendors being ready. While most software has the ability to electronically send non-controlled prescriptions, some are still lacking the ability to electronically prescribe controlled substances (EPCS). EPCS capability requires completing an audit by a DEA-approved auditor to prove that certain security measures are in place. The advantages of e-Prescribing are plentiful from patient safety to efficiency in prescribing to combatting doctor shopping. However, many of these benefits could be lost by either using software that isn’t truly ready or rushing into trying to use software that is complex. The additional time will be beneficial for prescribers. Providers can now pick the solution that is right for them without being rushed and get their practice adjusted to e-prescribing more slowly. The delay will also take some of the pressure off those vendors who are still trying to add EPCS capabilities. While MDToolbox was one of the first vendors to be approved by the DEA for sending controlled substances, we understand the complexities involved in becoming an approved vendor. It is not an easy process. This additional year will give EHRs and other software vendors the necessary time to implement the requirements as smoothly as possible into their workflows and ensure they do not lose their providers to other vendors. Many vendors have chosen to partner with other vendors to help them meet the requirements. This is a great way to integrate EPCS and the required features such as Identity Proofing, 2-factor authentication, and Permissions without having to exert many resources. Having all of the required features come together in a package that can seamlessly integrate takes a lot of the legwork, expenses, and stress out of the process. Whatever path vendors and prescribers choose to take, they must seize this opportunity to guarantee they are fully ready when the new deadline comes around. In our previous post about Direct Messaging, we covered the major benefits of Direct Messaging. One of which being that Direct Messaging is part of Meaningful Use Stage 2 requirements. In this post we are going to dig into a few of the details behind what criteria is required for Meaningful Use Stage 2 and give a brief description of each, along with how MDToolbox helps with the criteria in our Direct Messaging system. In Stage 2, providers must be able to send Continuity of Care Documents (CCD/CDA) formatted summary files using Direct Messaging when they transition a patient or refer a patient to another provider or organization. B2 involves first creating the care summary file, which is required to have a minimum field set as well as be formatted in a certain XML format that all other health record systems will understand. And then secondly, transmitting the document via Direct Messaging. The objective requires that the messages are sent using the Direct Protocol which uses secure direct mail addresses and encryption exchange between the servers. Electronic Health Record systems can have a separate “Direct inbox” for sending the message or many implement a Send button right from the Chart workflow for the provider – making transfers of chart records streamlined. Some HISP/Direct Messaging vendors (like MDToolbox) offer an API or web services that allow sending the message from anywhere in the application per the EHRs needs. This allows an EHR testing on B2 to have a process that creates the care document and attaches it to a Direct Messaging email for the provider that not only meets the criteria but is a huge benefits to the end users. When the message is sent it becomes encrypted and can only be decrypted by the intended recipient’s system, keeping the patients data safe and secure. In Stage 2, providers must also be able to receive these CCD/CDA and other care summary files from other providers and facilities. The first part of the criteria basically just requires having the ability to receive Direct messages. The messages can be received in a standalone inbox provided by your HISP or an embedded inbox within the EHR. Secondly, for this criteria, the EHR must be capable of displaying the received files (most of them XML formatted) in “Human Readable” or a nice formatted output for providers. The EHR needs to apply a stylesheet or other formatting so that the provider can see what was received for many types of files including the CCD/CDA, and other files like CCR (a different XML format). And finally the criteria also involves incorporating the received attachments. The EHR must be able to upload both the document itself, and for CCD/CDA files be able to allow clinical information reconciliation of things like allergies and problem lists (allowing providers to optionally import data elements to the chart). Electronic Health Records can incorporate an inbox right inside of the EHR with built in tools for incorporating when signing up with a HISP that offers an API/Web services (like MDToolbox). This gives huge benefits to the provider and makes this their most important (and best) inbox they monitor on a daily basis. With a few clicks, referral charts can be reviewed and filed in the electronic chart. In Stage 2, patients must also have access to their CCD Summary of Care files and chart data. Not only do EHRs have to add the ability to view and download the summary from their “patient portal”, but they also need to give patients and their authorized agents the ability to securely transmit the care summary to other providers. The Transmit of the data is required to be done through direct messaging. Some third party vendors patient portals come with direct messaging, but for EHRs that have their own patient portal this becomes a challenge. EHRs must give their patients a new “Send” button that would allow entering another provider or facilities direct address and send it via the secure Direct messaging method. As thousands of providers and facilities around the country start taking advantage of the secure “Direct” messaging, it really gives them more than just a couple of check boxes on their meaningful use attestation - it’s a new and better way to transfer records, discuss patient care and communicate. It's more secure, more efficient and can be a great time saver over the traditional communication methods. Want more info on Meaningful Use or Direct Messaging API with MDToolbox? Check out our Direct Messaging page and contact us today at info@mdtoolbox.com. Direct Messaging and Data Exchange: What types of files and data can EHRs exchange? Is e-Sending Schedule II drugs allowed in Texas? What are the Texas State Guidelines? In order to comply with the Texas DPS guidelines, there are several things prescribers must be aware of and know before they start using an EPCS program. Prescribers must make sure that their vendor is certified by the DEA, meaning that they passed the required third party audit. Prescribers will also want to be sure that the vendor has EPCS capability activated for their state. Prescribers must also make sure that all their necessary credentials are included when e-Sending a prescription. The numbers prescribers now put down for paper prescriptions, their DPS, DEA and APN numbers for advanced practice nurses must also be on their electronic prescriptions as well. When prescribers are setting up their e-prescribing account they want to make sure that this information can be entered in the appropriate fields. Paper prescriptions written in the state of Texas for schedule II drugs require that each prescription be printed on DPS required paper that has a unique Control Number listed for the pharmacy to record. With e-prescribing all control number information, locating, and documenting is now handled entirely on the pharmacies end electronically. Texas DPS completed their beta testing of EPCS March 1, 2014. The purpose of which was to monitor Schedule II prescriptions for abuse, prescribing patterns, patients attempting to get prescriptions from multiple doctors, and fraudulent prescriptions. Also, to make sure all reporting on both the provider’s end and the pharmacy’s end was done accurately and in a timely manner. After the results of the testing came back, the outcome was clear. Provider’s information was safer, as their DPS and DEA numbers were no longer floating around on written prescriptions for people to try to forge prescriptions with. The DPS information is also now easier and faster to track with everything being electronic. Patients’ information was also safer and relayed faster as there was no longer the constant need to rely on a phone or fax for patient information that may or may not have made it to the desired party on the other end. Electronically prescribing controlled substances has proven to not only be a viable alternative to paper prescriptions in Texas, but an improvement. To get more information on EPCS or to start sending controlled substance electronically contact us at info@mdtoolbox.com or visit our EPCS page. The DEA has officially ruled that all hydrocodone combination products or HCPs (ex: Vicodin and Lortab) are to be rescheduled, moving them from Schedule III to II based on the Controlled Substances Act1. The ruling was made official August 22, 2014 and will be put into effect starting October 6, 2014. HOW DOES THIS EFFECT PRESRCIBING? Starting next week, all HCPs will be schedule II controlled substances (CS). This will cause several things to change and impact providers, as well as patients alike. Providers will no longer be able to write prescriptions for HCPs with refills and they will be limited to a 3 month supply at most (the rule also mandates that doctors must write the prescriptions in 30-day increments that can only be filled sequentially). Pain patients using the drugs will have to visit their doctors every three months for a new prescription. The rule also limits which providers in certain states can write these prescriptions, as well as how they can be sent. Due to HCPs now being a schedule II CS, only practitioners registered with the DEA will be able to prescribe the drugs. However, some states have separate laws in place that limit this even further. For example, in the states of Alabama, Georgia, Missouri, and South Carolina nurse practitioners are not allowed to prescribe, administer, or dispense schedule II CSs. According to the DEA, prescriptions for schedule II CSs cannot be phoned in or faxed to a pharmacy with the exception of emergency situations. In the case one of the situations comes to pass, the provider that authorized the emergency oral prescription has 7 days to produce a paper prescription to the pharmacy, which can be hand delivered or mailed if post marked within the 7 day period. If a prescription is faxed, it cannot be dispensed until a physical copy of the prescription is presented and reviewed. A prescription for a schedule II CS must be written with ink, indelible pencil, typed, or generated by an electronic system on tamper-proof prescription forms and hand signed if they are to be hand delivered to the pharmacy. The second way that a provider can prescribe a schedule II drug is through e-Prescribing. EPCS, or Electronic Prescribing of Controlled Substances, offers a viable solution for prescribers to not only meet the DEA requirements for schedule II prescriptions, but increase their workflow and patient safety at the same time. With Electronic Prescriptions, the prescriber also must sign each prescription but instead of using ink, he uses a digital signature that is generated with a two-factor sign-off credential. When the prescription is sent electronically the pharmacist can see that the order was electronically signed and knows that it came from the prescriber and was not forged. EPCS is approved for Prescribers in 49 states for Schedule III-V and in 47 States for Schedule II drugs, meaning in most of the U.S. prescribers can use EPCS to safely send Vicodin and other schedule II drugs. MDToolbox has made the process easy and straightforward for providers. When a provider first signs up for EPCS, they will go through an identity proofing process and set up their two factor credentials. Once set up is complete, writing and sending a prescription for a CS is just as easy as a non CS, the only difference being entering the two-factor signing credentials that assures it is the doctor authorizing the prescription. To get more information on how EPCS works, or to find out about signing up for our EPCS Stand Alone or EHR Integration Add on, contact us at info@mdtoolbox.com or visit our EPCS page. Last week we covered the basics of what Direct messaging is in the healthcare field. This week we focus on some of the biggest benefits of using Direct messaging. By eliminating the need for outdated communication methods, such as faxing and mailing, and enabling electronic health information exchange with Direct messaging, communication is greatly improved between health care providers. Protected Health Information (PHI) is not only easier to send and receive electronically, but faster. Instead of waiting for a fax or even worse, snail mail, Direct messaging allows for sending and receiving information almost instantaneously, increasing the efficiency and effectiveness of care coordination. Faxes and envelopes could fall into the wrong hands. Direct messaging increases the security of sending PHI information by encrypting messages and files and ensuring they are only accessible by the intended recipient. When a patient’s information is sent by mail or fax, it still needs to be manually entered into the provider’s EHR. By sending the information electronically, Direct messaging eliminates the need for this data entry and reduces the administrative workload. Providers can spend more time with their patients, and less time on paper charts. Some Direct messaging systems, like MDToolbox-Direct, can also be integrated right into an EHR's workflow. This increases the workflow even further by allowing providers to send and receive Direct messages in their EHR without having to log into a separate system, as well as incorporate any received information into the patient’s chart right at the time of receiving it. In addition to the time saved with Direct messaging, providers can also save money by not having to pay for faxing or postage. Furthermore, with the improved communication between providers that Direct messaging provides, duplicate procedures and tests can be avoided. Direct messaging ensures clear and more complete information reaches the correct locations. Illegibility issues due to faxing or handwriting are eliminated by sending the information electronically and providers can be confident the information they send and receive is accurate. At MDToolbox, we focus on providing easy-to-integrate Meaningful Use tools. We recently expanded our product offerings to include MDToolbox-Direct, a Direct Messaging Module that meets Meaningful Use Stage 2 criteria. With our flagship product, MDToolbox-Rx, we focus on sending and receiving e-Prescribing messages between providers and pharmacies. We are excited now to be able to facilitate a different type of messaging - Direct messaging. So, what exactly is Direct messaging? Direct Messaging is a secure way for healthcare providers and organizations to send clinical messages and exchange Protected Health Information (PHI). Providers and organizations can send secure electronic messages to each other, including attachments such as Continuity of Care Documents (CCD) files, Referral Documents, images such as X-rays, and other types of medical files. This eliminates the need for using less secure methods that can put patient data at risk such as faxing, e-mailing, phoning, or standard mail. How is Direct Messaging different than email? Direct messaging sounds very similar to regular email, and generally speaking, it is. Providers and organizations have a Direct address (just like an email address) that they send and receive messages to/from. However, there are some very important differences. Direct messaging requires all users to have a designated Direct address that can send and receive authenticated, encrypted messages. All messages and attachments sent must meet certain encryption standards that allow only the intended recipient(s) to decrypt and read the messages and attachments. These standards were developed by the Office of the National Coordinator for Health Information Technology (ONC) as part of the Direct Project. How do I get Direct Messaging? Organizations called Health Information Services Providers (HISP) provide the Direct addresses to providers and organizations and facilitate the encrypted messaging. So instead of an email provider like Google or Outlook handling the message exchange, a HISP is responsible for securely routing and encrypting/decrypting the messages. MDToolbox has partnered with Surescripts, a trusted industry leader, to provide HISP services and our MDToolbox-Direct module can be utilized stand alone for providers and organizations or easily integrated with EHRs and other Health IT systems. To find out more contact us at info@mdtoolbox.com or use our contact page. 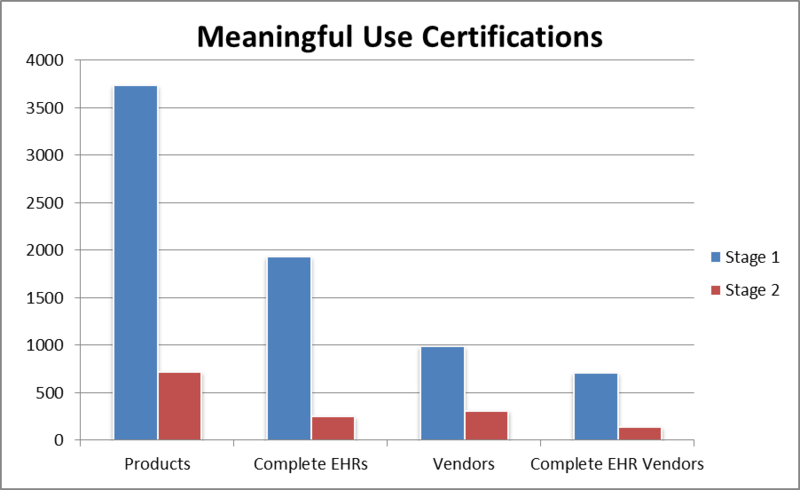 Meaningful Use Stage 2 started at the beginning of the year and it has been off to a slow start. A report from CMS last month showed that only 50 eligible professionals (EPs) had attested to Stage 21. While the latest numbers given have increased to 447 EPs that have attested to Stage 2, this is still a relatively small number.2 Such low numbers point towards a lack of certified products. A review of the ONC HIT’s Certified Health IT Product List shows that there were over 3,500 products certified for Ambulatory Stage 1 and only a little over 700 are certified for Ambulatory Stage 2. It is also interesting to note that out of 988 developers who certified products for Stage 1 (many had several different products, even hundreds), there are only 312 vendors with Stage 2 products. Of those vendors with Stage 2 products, only 140 have complete EHRs that meet all of the criteria for attesting to Stage 2. CMS has proposed a potential delay in the requirement of all providers to use a 2014 Stage 2 certified product this year.3 If the pending rule passes, then providers will have one more year to use their stage 1 product. This would also give EHRs extra time to get their product certified for the harder Stage 2 criteria. The proposed rule is only for 2014, EPs would be required to use 2014 Edition CEHRT for the EHR reporting periods in 2015. The rule is open for comments until July 21. If the rule passes this gives EHRs more time to meet the new criteria of stage 2 and get their product certified. If it doesn’t pass, providers wanting to attest this year that do not have a Stage 2 certified product may be out of luck. In order to attest to Stage 2 this year, physicians must report for 90 days. As it is now, those attesting to Stage 1 for the first time need to report for 90 days before October 1st, 2014 in order to avoid the 1% Medicare penalty next year. This means they would need to start by July 1st, only a little over a week away and before the proposed rule could be finalized. As a vendor who recently achieved ONC HIT 2014 Edition Modular EHR certification for our e-Prescribing product, MDToolbox-Rx, we understand how challenging meeting the Stage 2 requirements can be. Because of this, we hope that the pending CMS rule is approved to give other vendors and providers the extra time they need to meet the criteria. 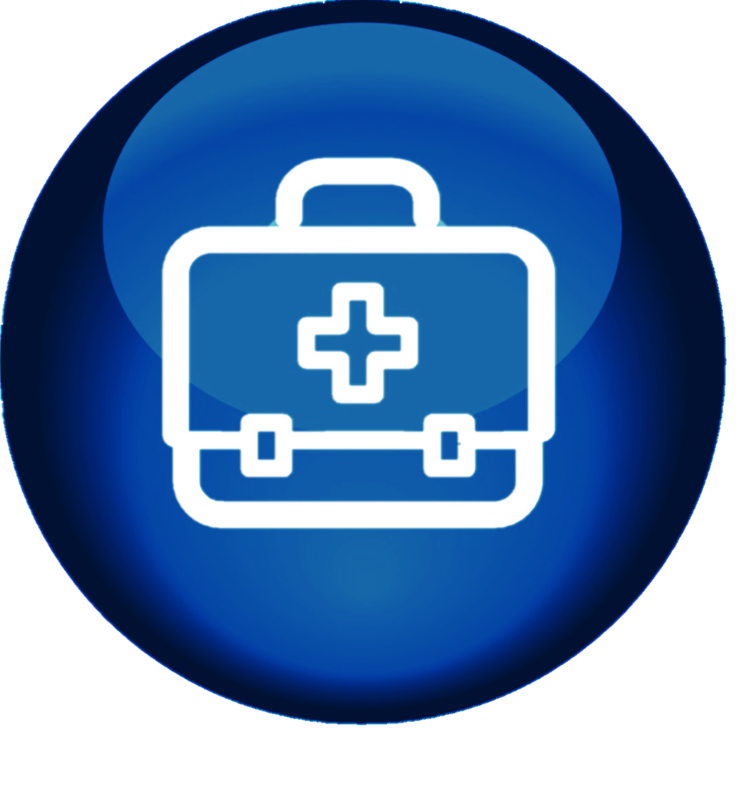 MDToolbox offers meaningful use tools to help vendors quickly and easily meet some of the most challenging criteria. EHRs who integrate our meaningful use certified e-Prescribing module can cross 9 criteria off their list and inherit our certification number towards their Complete EHR. MDToolbox has also added a new MU2 Direct Messaging Module, MDToolbox-Direct, to our product line. The Direct messaging module allows sending secure clinical messages via the Surescripts network that meet Meaningful Use Transition of Care and View, Download, Transmit criteria. Contact us today to find out more about how we can help you get Stage 2 certified.